This artichoke is so beautiful I just had to show you. Rarely are they so “picture perfect.” Depending on the weather, April is the last month for local artichokes from Castroville. This coastal area, between San Francisco and Monterey, grows some of the best artichokes in the world. Take a tour of an artichoke farm at www.artichokes.org. My very simple dip for steamed artichokes won over my skeptical Italian mother-in-law some years ago. She frowned at the thought of anything but stuffed, baked chokes. That is, until she tasted my concoction. From then on, wintertime Sunday dinners were not complete without artichokes for starters. Rinse artichoke(s). With a serrated knife, cut off the top quarter. Pull off the small leaves around the bottom and cut off the stem. With scissors, snip off the tops of the leaves to remove the sharp points. Sit artichoke, stem side down, in a microwaveable bowl. Add a tablespoon or two of water. Cover and microwave on high about 2 minutes* per small-medium choke (about 4 minutes for large artichokes). The exact timing will take some practice, and depends on the temperature of the artichoke. Cold chokes take longer to cook. Remove from microwave and let stand at room temperature, covered, until cooled. Then pour off excess water and refrigerate until ready to eat. My casual way to eat artichokes (forget scooping out the center! ): Place the artichokes on a plate. One at a time peel off the leaves, starting from the bottom, and dip into mayonnaise (a little will do). Pull the underside of the leaf over your bottom teeth, scraping off the subtle sweet artichoke flesh. When all gobbled up, remove the tiny soft leaves and fuzz from the stem by sliding a paring knife under it as you would do with a grapefruit. 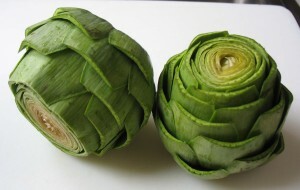 Cut the remaining artichoke meat into 2-4 pieces. Dip into mayonnaise and enjoy! 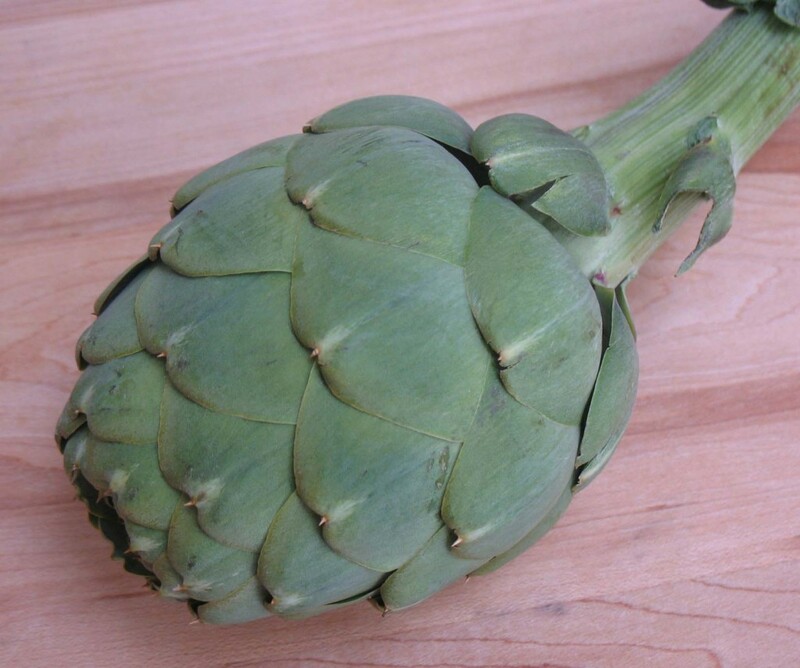 – When buying artichokes, choose those with leaves that are closed or hugging the center; they’re freshest. – The “steamed” artichoke photo above is a large one that two of us share. For more people, I often cook 4 smaller chokes at a time in a flat-bottomed Pyrex casserole dish that happens to have a great cover. Four chokes at a time will take 7-8 minutes on high. It is always best to undercook, then add more time if needed. Poke a knife into the bottom of the artichoke. If it is soft, it’s done. – To steam artichokes on the stovetop you need a metal steam basket or similar. Steam baskets are collapsable, colander-like racks with little legs, that fit medium sauce pans or up to 6-qt pots. Fill a pan with about 1-inch or so of water (pan size depends on how many artichokes you are cooking). 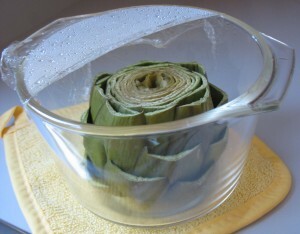 Sit the steam basket in the pan and place prepared artichokes on the steamer, stem side down. Cover and cook on high 30 minutes or until artichoke bottoms are tender. Check water level several times; add more water as needed. My steamed artichokes take about 45 minutes, stovetop, cooking 3 at a time in steamer pan atop boiling water. I need more than an inch of water for that time duration to prevent boiling the water pan dry. Am hoping to attend the Artichoke Festival this year in May. hope, hope! Thank you for the feedback, Jane! I’ve not steamed artichokes on the stovetop for sometime now. I’ll edit the instructions. When is the artichoke festival this May? Is it in downtown Castroville?